Seventy international researchers attended the 5th conference on Digital Libraries for Musicology (DLfM) in Paris, France, organised by the FAST project in collaboration with the Unlocking Musicology project and the IReMus centre of the CNRS (Institut de recherche en Musicologie, Centre national de la recherche scientifique). Dr Kevin Page, senior researcher at FAST partner the University of Oxford, served as programme and general chair for the conference, working with local chairs Dr Christophe Guillotel-Nothmann and Dr Cécile Davy-Rigaux, CNRS Directrice de recherche. 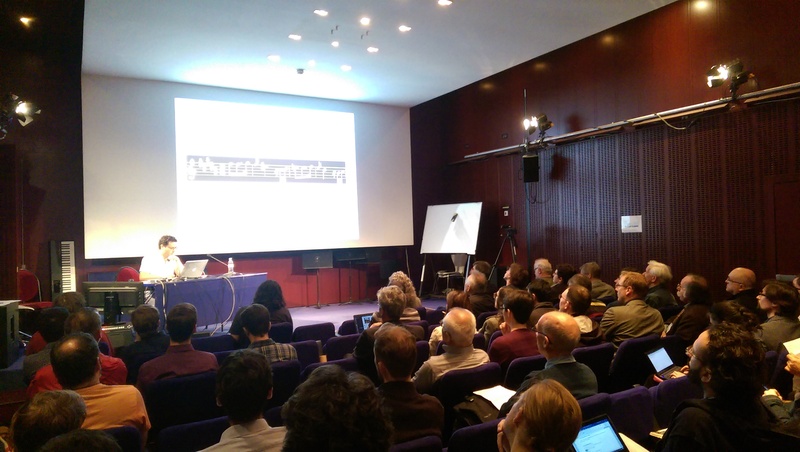 This year DLfM was held at the Institut de Recherche et Coordination Acoustique/Musique (IRCAM) in Paris, France, a world-renowned and ground-breaking centre working at the intersection of music and technology. The programme showcased research into the application of computational and informatics approaches for the study, analysis, and organisation of digital music, and music-related, corpora. The papers were presented across four themed sessions on Technological Advances, Digital Studies, Recognition and Encoding, and Collections, with the proceedings forming part of the ACM ICPS series and available online with open access. The FAST project’s MELD framework featured in a paper at the conference, co-authored by FAST team member and MELD lead developer David Weigl, alongside colleagues from the University of Oxford e-Research Centre and Faculty of Music. The paper describes how MELD was used to create an interactive exhibition on the work of composer Frederick Delius (1862–1934), using Linked Data to combine digital material from the British Library, Delius Trust, and an annotated string quartet performance recorded earlier this year in Oxford. The technical innovations drive an environment for enriched engagement with musical sources and give an insight into the creative process.